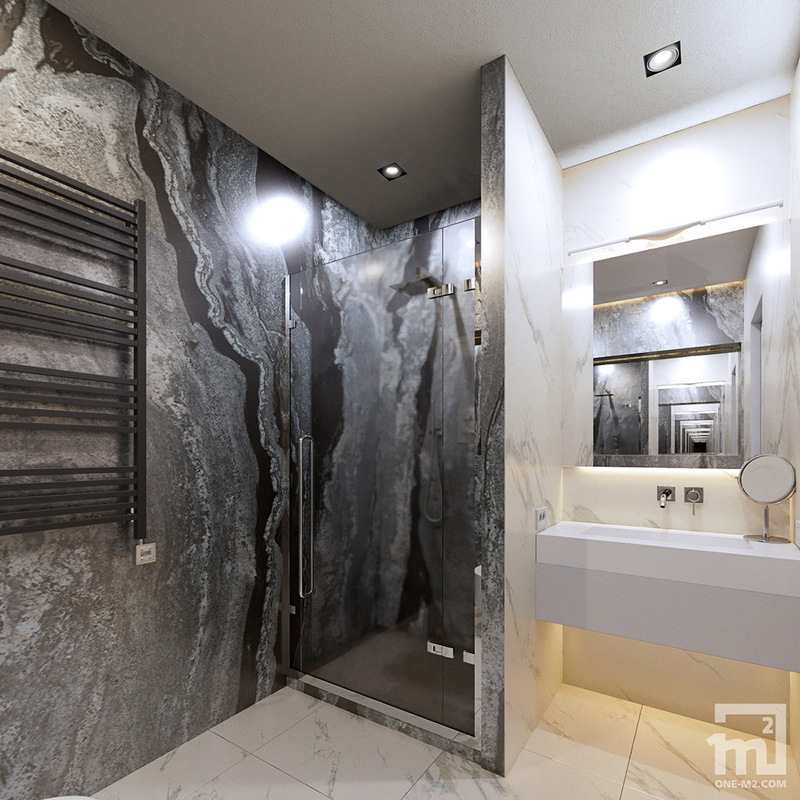 Mirrors are often used to increase the sense of space and light in a room, but what other ways can we introduce reflective surfaces within a decor scheme? 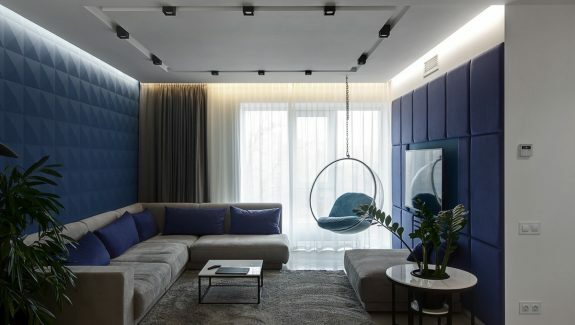 This modern apartment interior in Kyiv, Ukraine, designed by One M2, has a few different ideas on the subject. 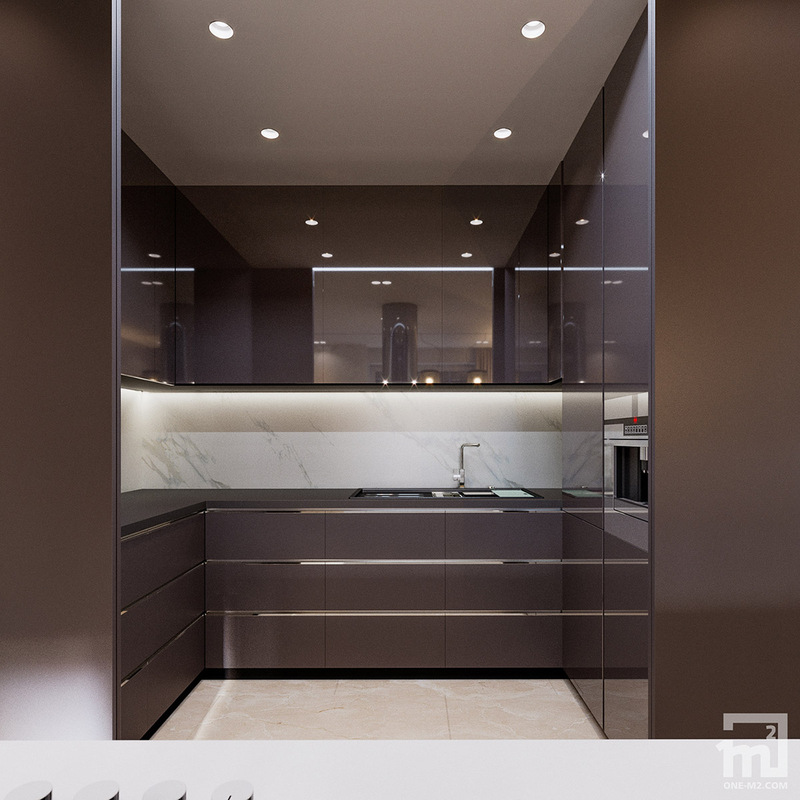 Smoked glass tops, doors and closets, glossy kitchen cabinets and chrome fixtures have all been implemented to full space expanding effect in the 190 square metre home. The shiny surfaces thread more light through the living space by carrying natural light from windows, and bouncing the artificial glow from track lighting systems and recessed spots. 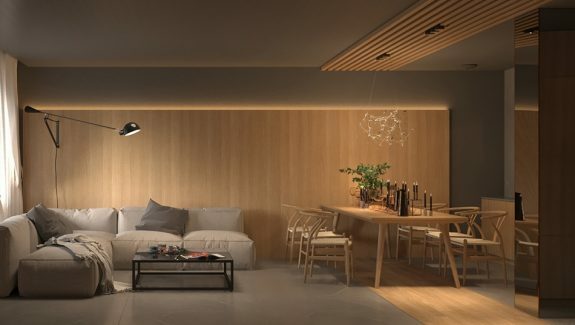 LED strips outline shelves and special features, whilst pendant lights bring extra style. 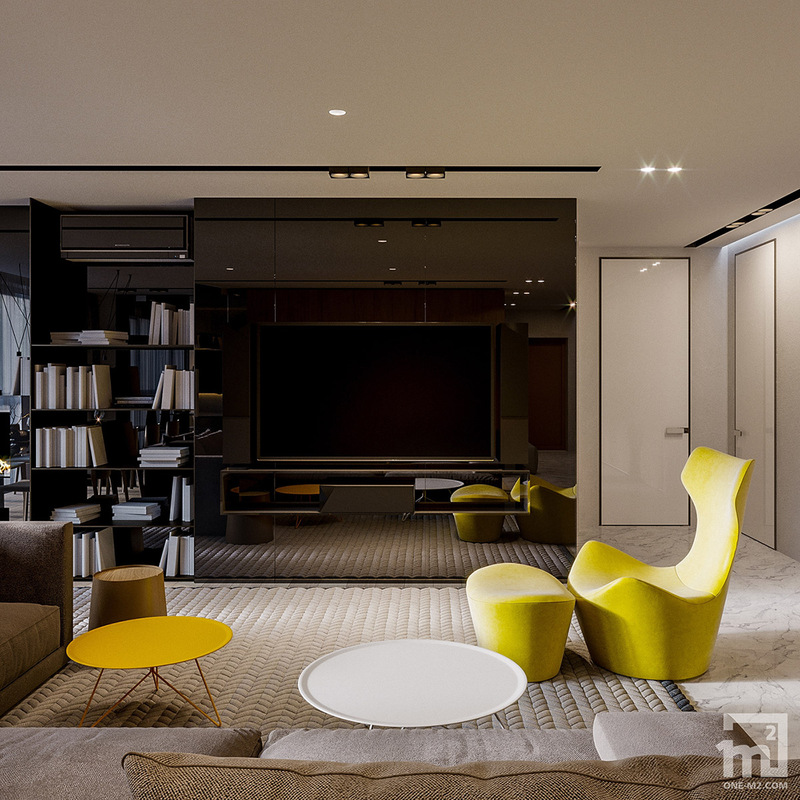 One of the main focal points inside the yellow accent living room is a glossy black tv wall. 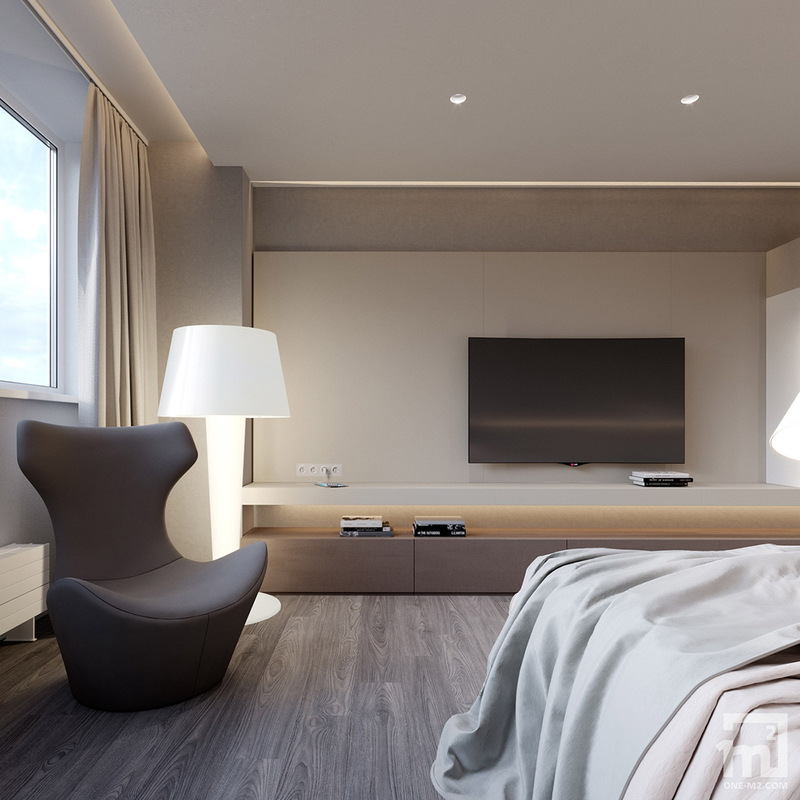 The whole room is mirrored in its high shine, and the black tv screen is disguised amongst the dark fronted media units. A bookcase to the left of the tv wall has a glossy back to continue the look across the remainder of the room’s length. 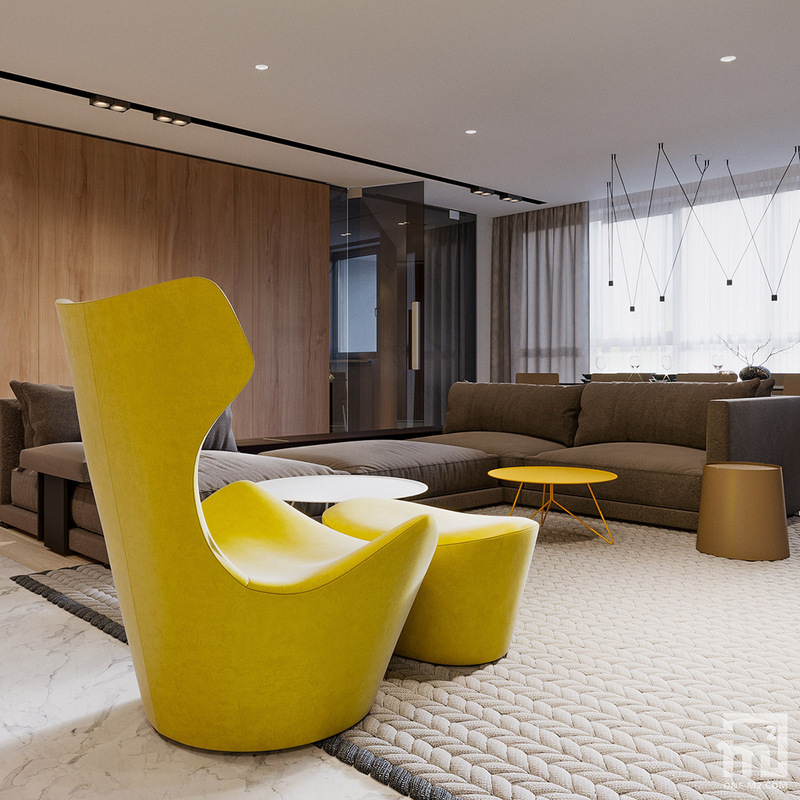 A set of modern coffee tables take up the centre spot in the lounge – one white and one yellow to match a bright accent chair. 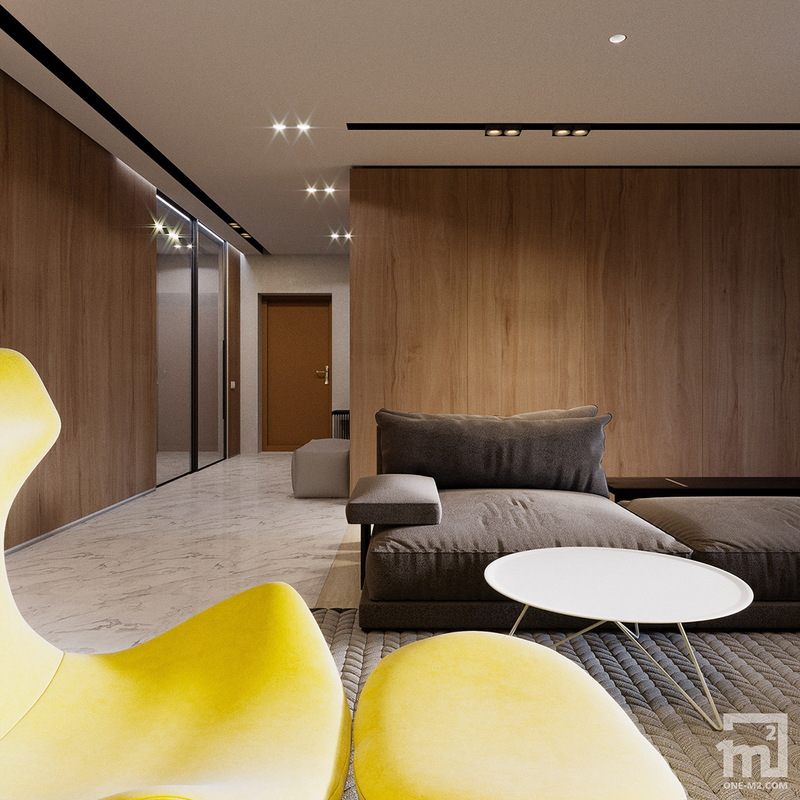 The yellow modern accent chair is the Piccola Papilio by Naoto Fukasawa. You can get a cheaper alternative on Wayfair. This also happens to be a swivel chair, and it has a matching yellow footstool that follows the same sweeping shape. The living room furniture is set on a chunky knit style area rug in a soft shade of grey. The sofa upholstery is just a tad darker, matching the rugs contrasting border. A small side table sits at the edge of a large L-shaped sofa. 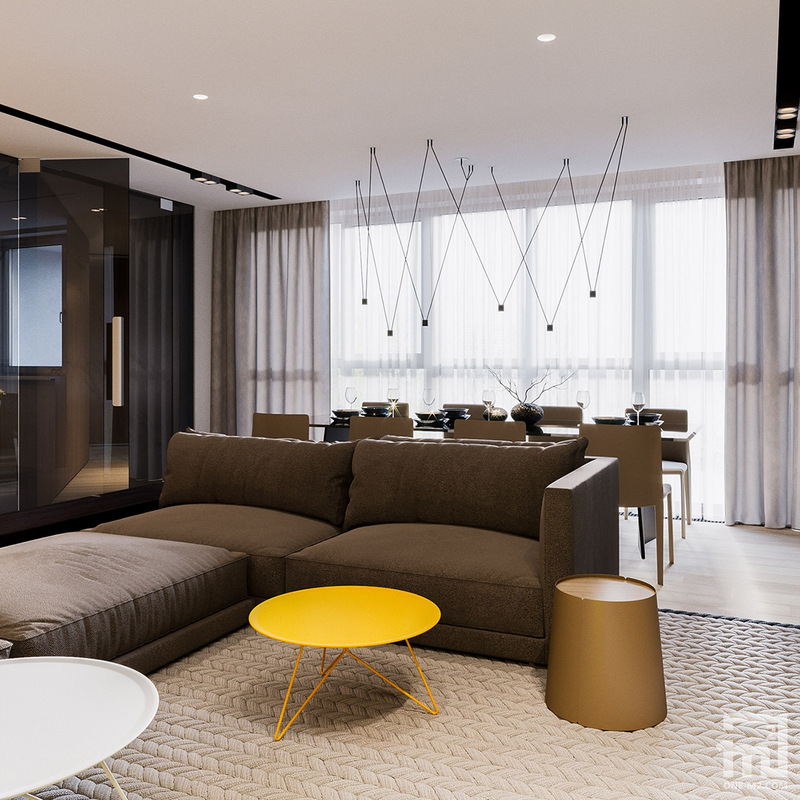 The sectional sofa works as a room divider to separate off a formal dining area from the comfortable lounge. 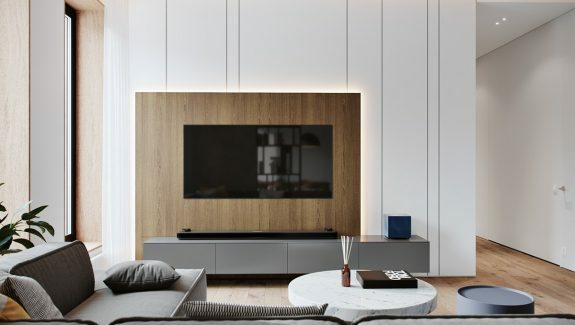 The lounge wall opposite the tv is clad with wooden panels. Smoked glass double doors lead through to the kitchen. 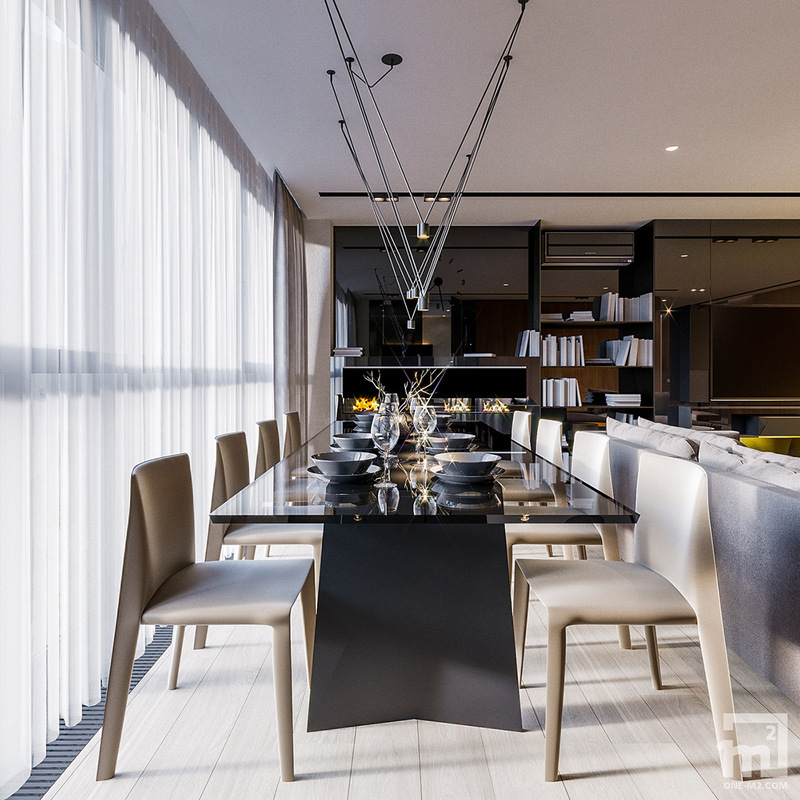 A smoked glass dining table reflects the twinkling lights of a modern chandelier above, which is the Vibia Match suspension. Light beige modern dining chairs contrast with the dark glass table top, but match perfectly with the light wood floor treatment. A contemporary letterbox fireplace burns at the far end of the table – serving both the dining room and lounge with cosy ambiance. 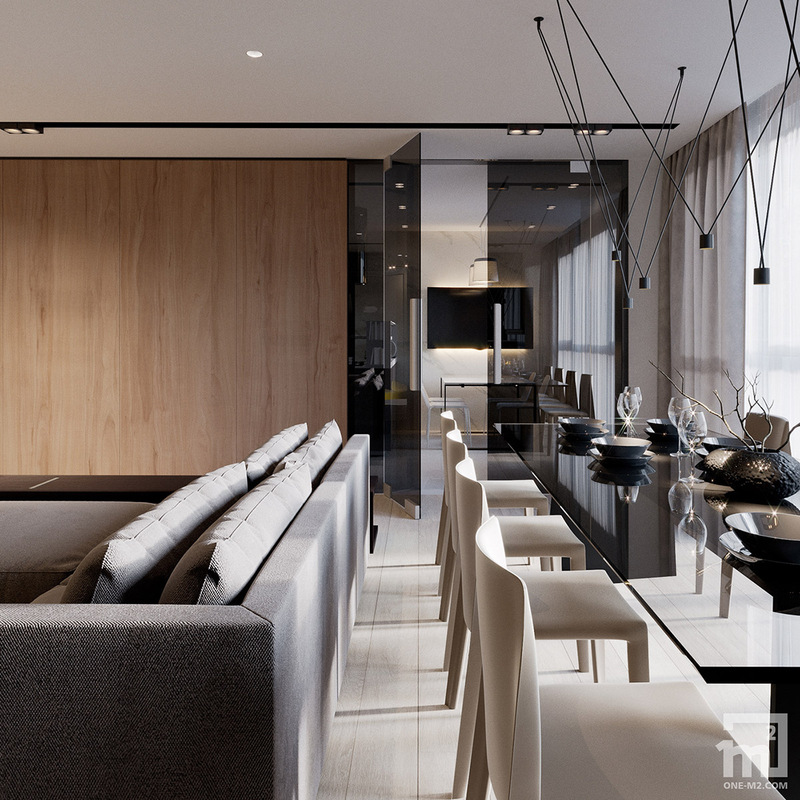 An additional dining area lies in line with the first, accessed via the smoked glass interior doors. 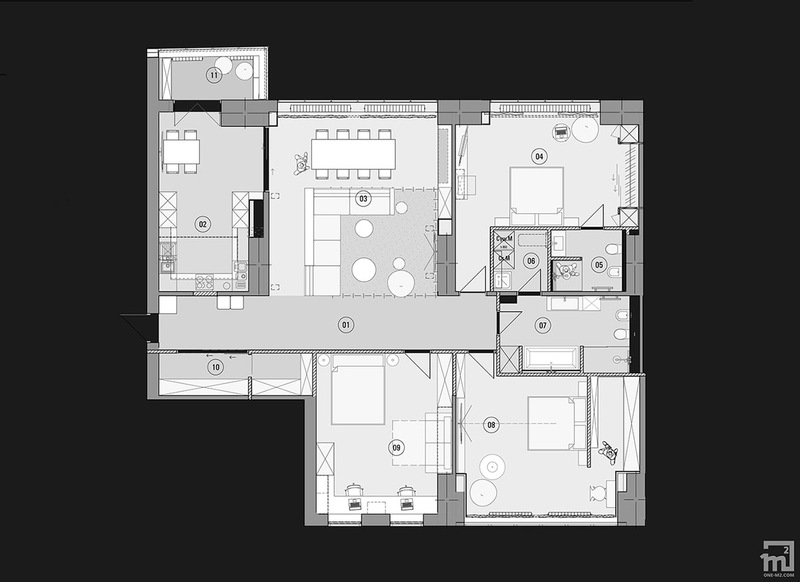 A modern kitchen is tucked around the corner out of direct sight; a peninsula further obscures the view of the prep area. 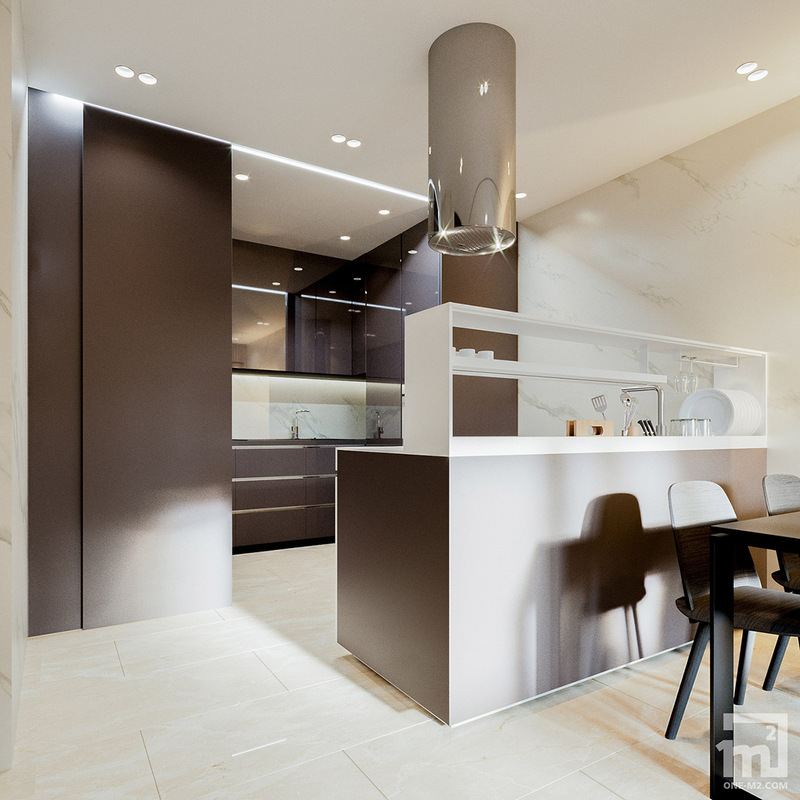 A chrome extractor chimney gleams over the cooking peninsula in the grey and white kitchen. 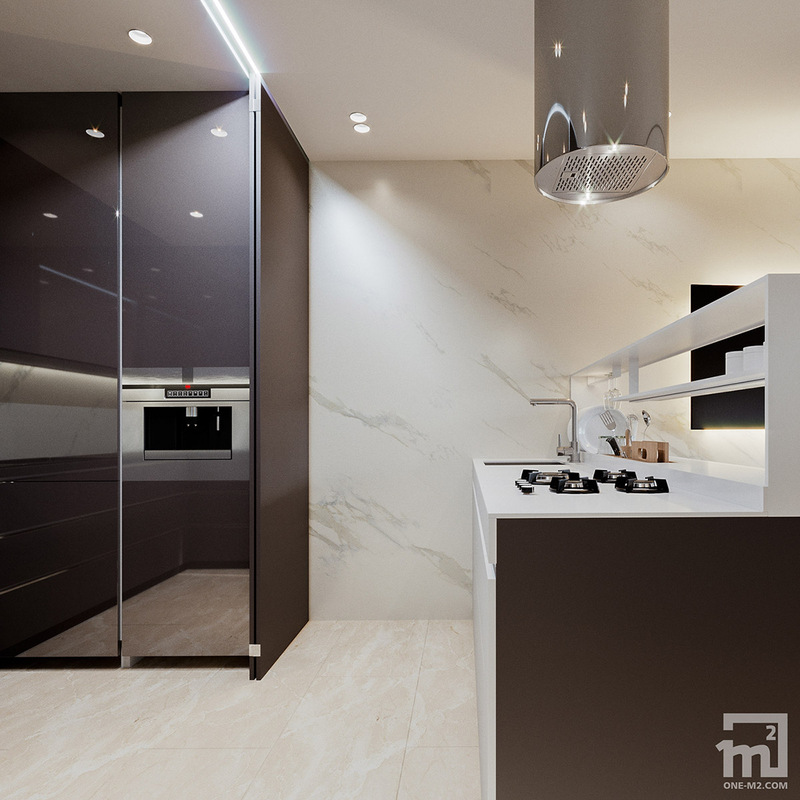 An open shelving unit tops the kitchen peninsula; it is equipped with dish drainers and wine glass holders by sink number one. 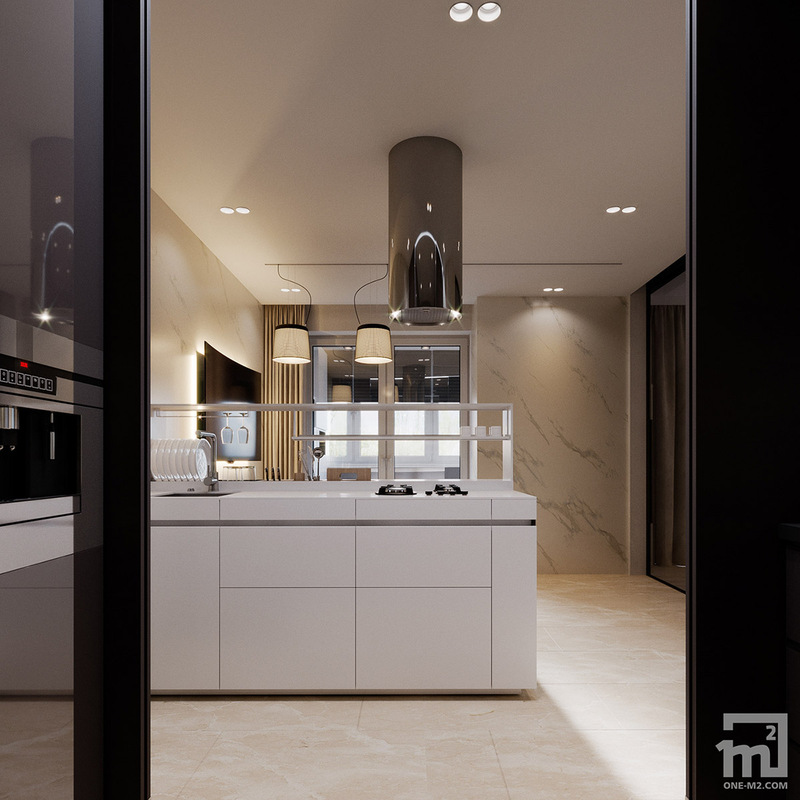 A second sink serves the back of the room, where a u-shaped kitchen arrangement of glossy grey cabinets with chrome trims and stainless steel built-in appliances cause shining reflections. 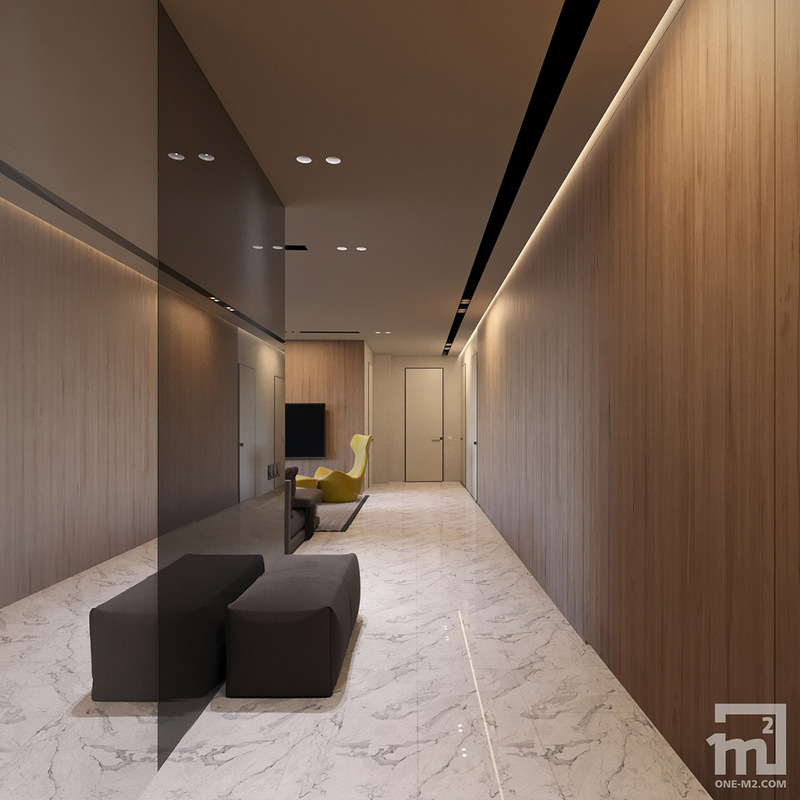 The home entryway leads into a wide hallway – which is made to look even wider by the huge mirrors that are installed along one wall. One half of the mirrored hallway is tinted glass, which creates the optical illusion of a dividing wall at the centre of the space by the seating. 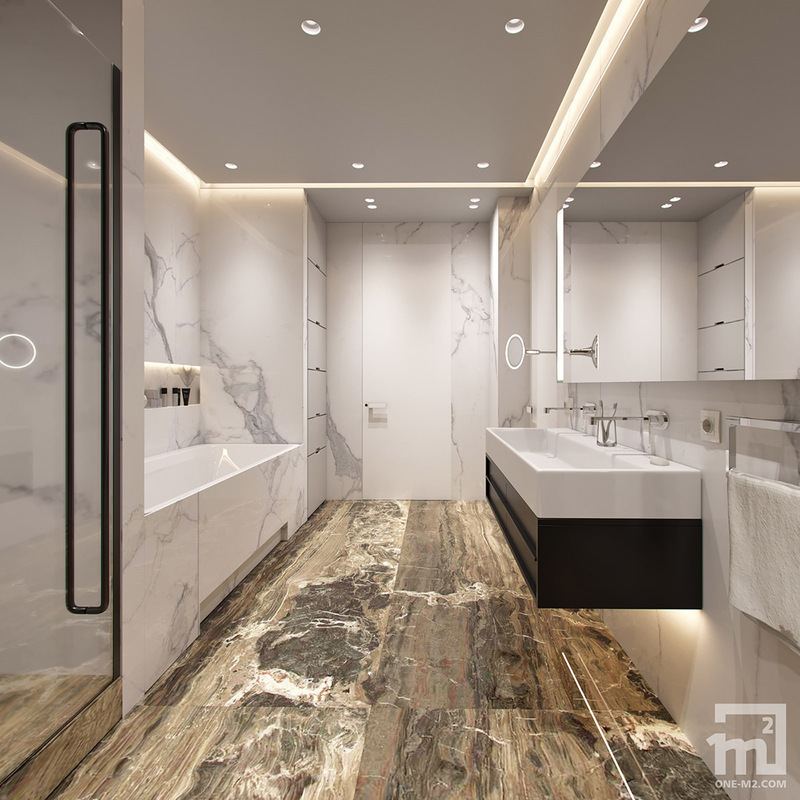 Marble floor tiles continue the light reflective theme. 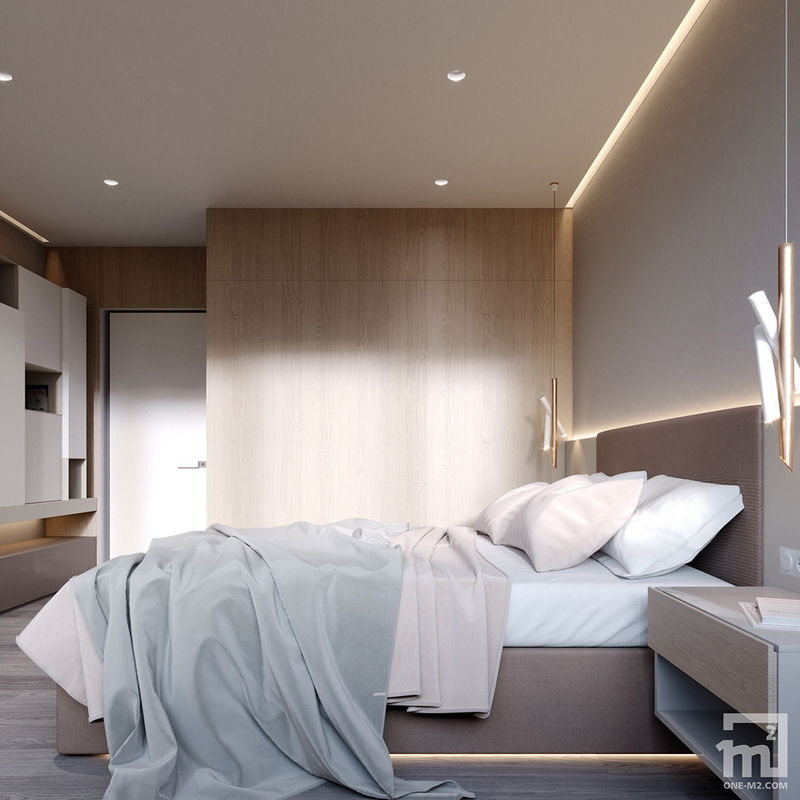 Two eye-catching bedroom pendant lights illuminate the bedsides in one of the three double bedrooms of the home. A couple of modern wall sconces bring light closer to the optimum reading position over the pillows. 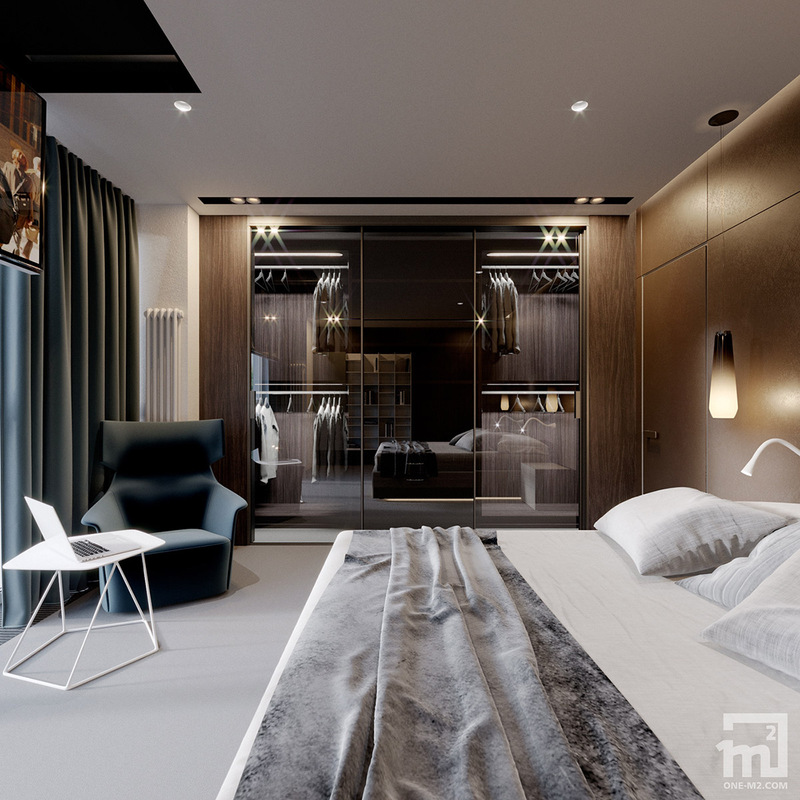 A glass fronted closet proudly puts designer garments on display under LED lighting. 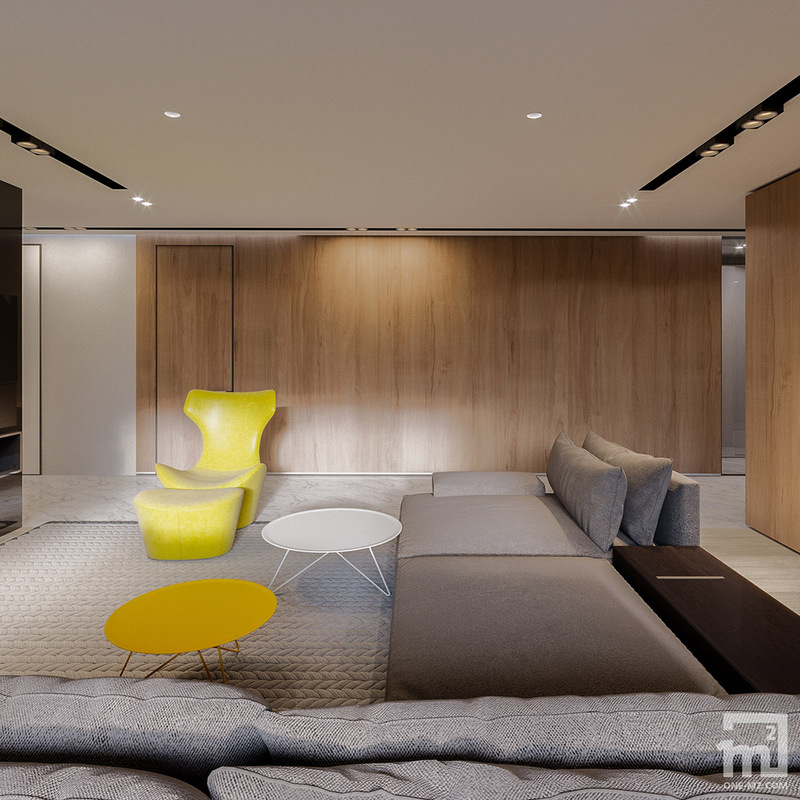 In front of the glass encased closet system, a modern armchair sits at a geometric laptop table. 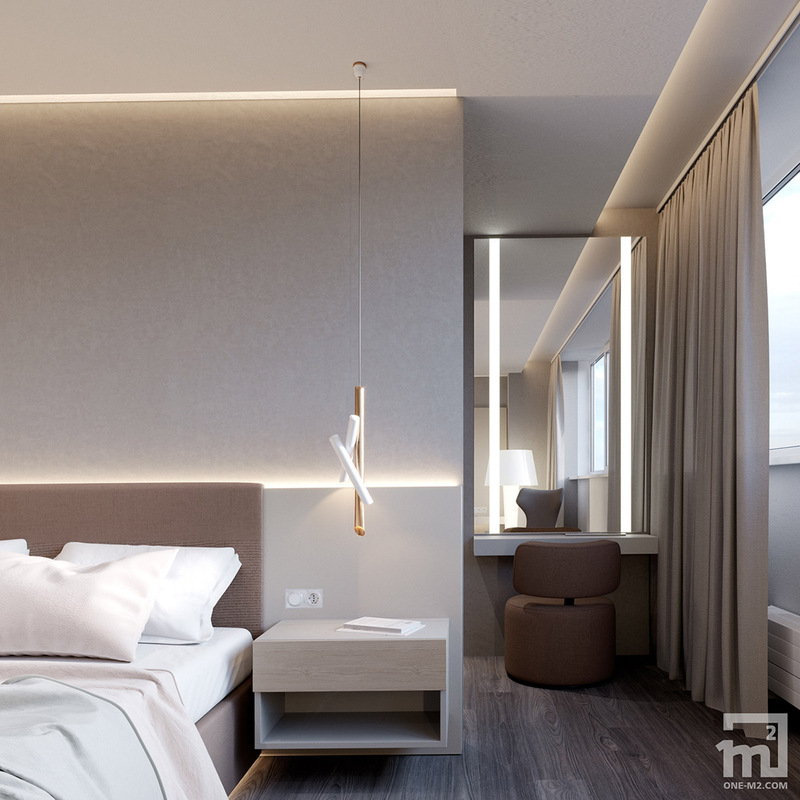 Recessed lighting washes illumination down the headboard wall and around the perimeter. A television drops down in front of the windows from its concealed position in the ceiling, to be viewed from the comfort of the bed. 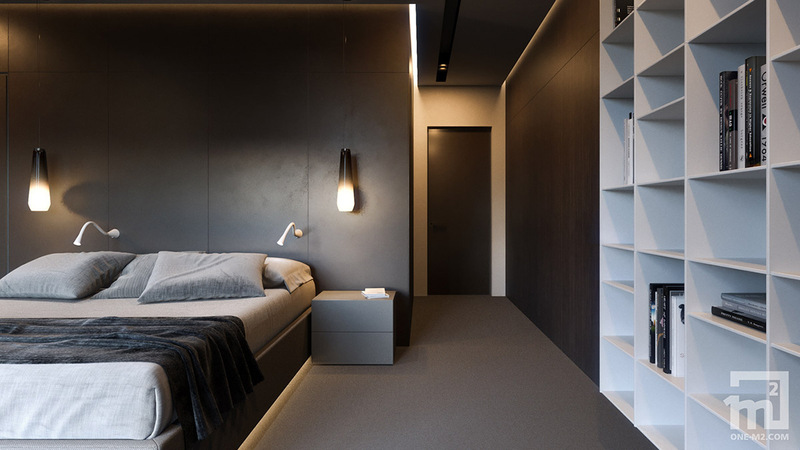 More beautiful pendant lights hang in modern bedroom number two, which is another double. 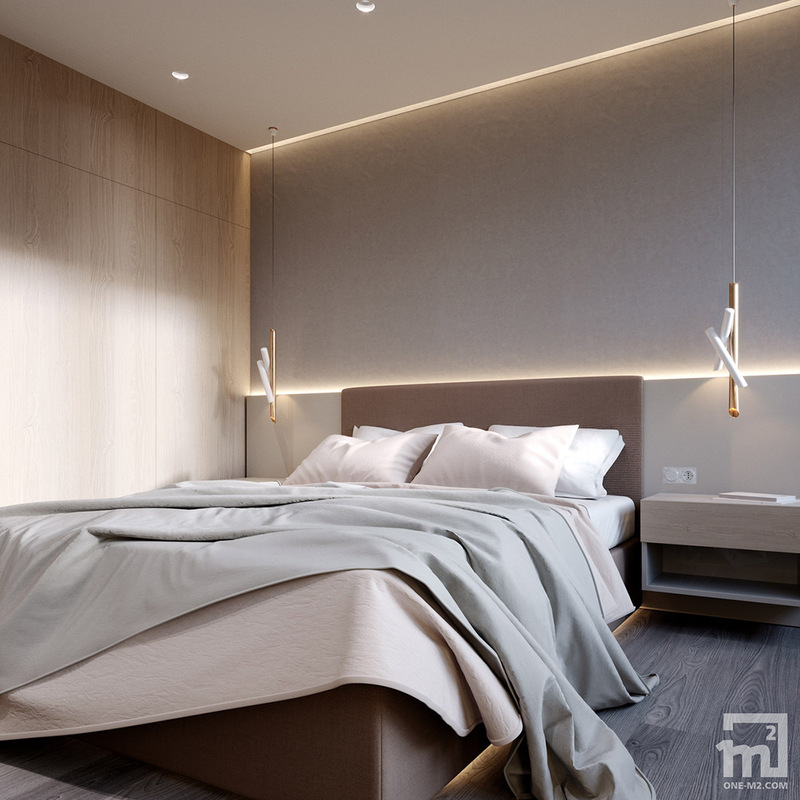 The attractive textured look of wooden wall panels continue into this room too. Another winged bedroom chair is seated in here, this time beside a quirky floor lamp to make a cosy reading spot. For more cool designs like this, check out these floor lamps. 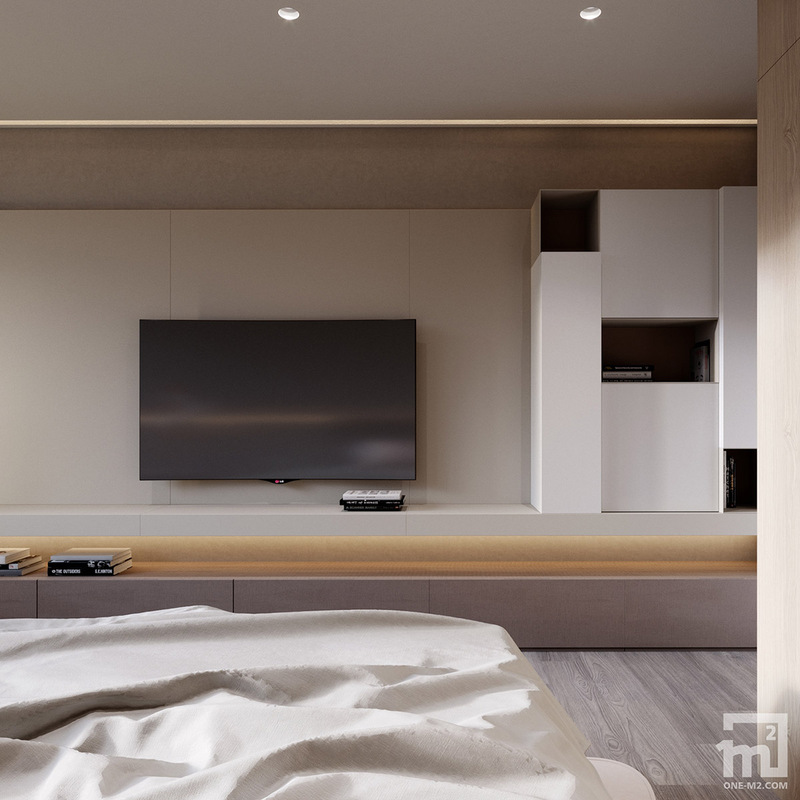 A media unit runs the length of the bedroom, beneath a long shelf. LED lighting illuminates the niche that is created between the two. An illuminated vanity mirror opens up an alcove to the side of the headboard wall. A vanity chair is pulled up at a shallow shelf that serves as a dressing table. The dressing table alcove is also the entryway to a walk-in closet – a full length mirror at the end of the closet reflects the vanity chair in the doorway. Ellipses of light shine inside open shelving and garment rails. 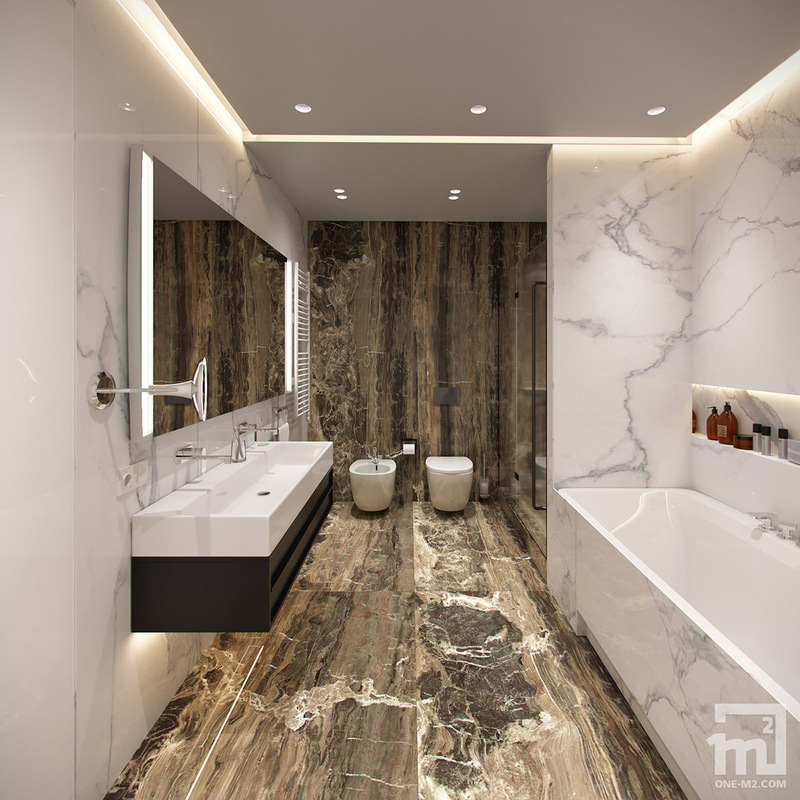 The family bathroom is a vision of stunning tile and marble. 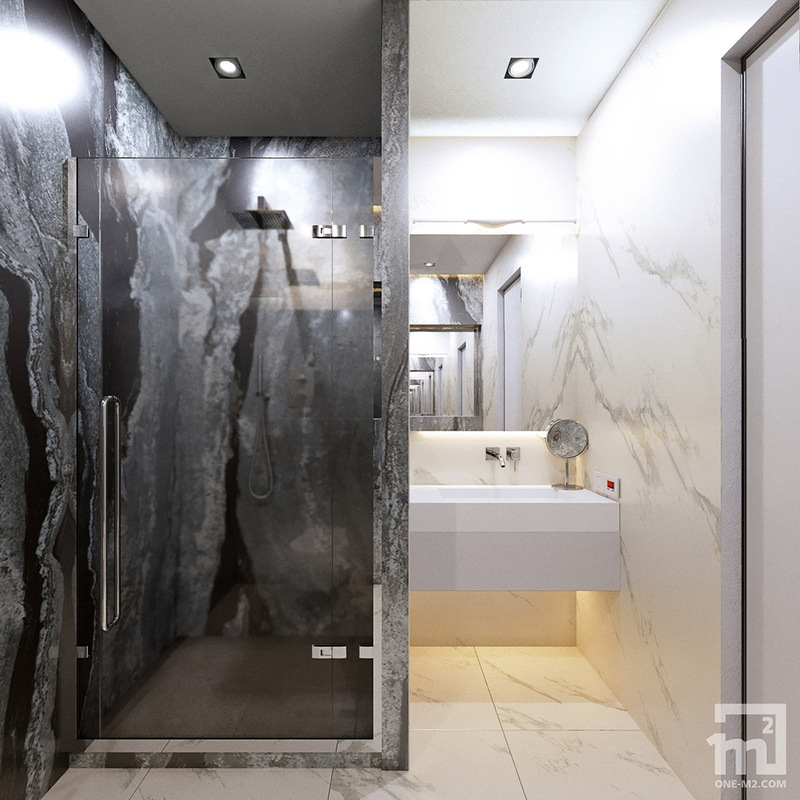 The generously sized space contains a built-in bathtub, floor to ceiling storage chamber, shower enclosure, toilet & bidet, and a double sink bathroom vanity. Ensuite facilities in the first double bedroom we toured are on a smaller scale but of the same luxurious standard. A marbled wet wall bounces back the light. 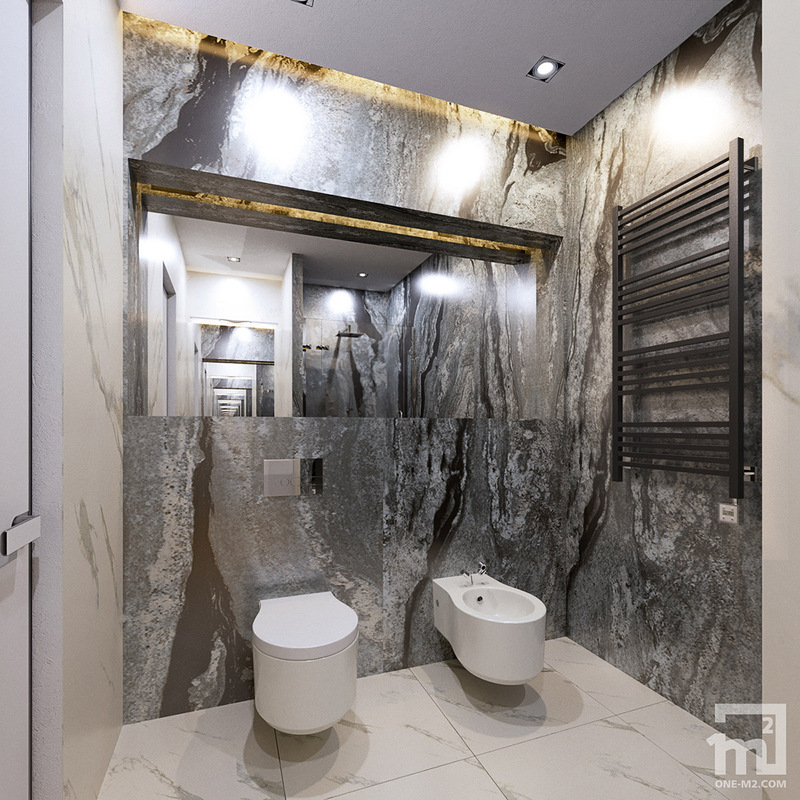 A wide mirror visually doubles the space. The last of the three double bedrooms in the apartment is a child’s room with a neat superhero theme.